"Looking Back at the Tsunami tragedy one is struck by a recurring feature widely prevalent in Sri Lanka namely the inefficiency of the state machinery to address the imperative needs caused by sudden disasters of huge proportions"
"What was troubling then was President Kumaratunga displaying all the signs of negative bungling as was typical in the past. As stated earlier Chandrika returned home and immediately dissolved the structures set up by her Prime Minister. " "The hackneyed phrase about people rising to the occasion came true in Sri Lanka after the raging tsunami killer-waves had done its job of destruction and devastation. The bulk of tsunami victims survived in the post-tsunami days because of the generosity of the people." Ten years ago on December 26, 2004 a series of giant tsunami waves engulfed the coasts and littoral areas in different parts of Sri Lanka. It was a terrible tragedy that resulted in tremendous loss of human life, limb and property. Until the destructive waves rolled over our shores on that fateful day most Sri Lankans were unaware of the Japanese word tsunami. Today it has entered the vocabulary of the Sri Lankan people in everyday life. Five days after the calamity, Sri Lanka’s national disaster management centre issued a report on December 31, 2004 outlining the loss and damages to life and property -- 28,508 people were killed and 5,023 people were reported missing but presumed to be dead, 12,482 people were injured while 899,408 people were displaced from 215,804 families affected by the tsunami. Apart from public buildings a total of 79,100 dwellings were destroyed, 20,708 houses partially damaged while 267,785 displaced people from 20,206 families were being housed in 791 makeshift camps. It was the single biggest tragedy caused by nature in post-independence Sri Lanka. The mass media, both national and international covered many aspects of the humanitarian catastrophe. I was then writing for “The Sunday Leader” from Canada. Editor Lasantha Wickrematunge had assigned specific areas to be covered by his journalistic team. Being in Canada there was no on-the-spot reporting for me but the editor asked me to focus on post-tsunami developments in the northern and eastern provinces. I did write several tsunami- related articles at the time as requested by him. The 10th anniversary of the Tsunami tragedy falls this week on Friday December 26. Even though the country is gripped by presidential election fever the 10th tsunami anniversary cannot pass unnoticed because of its enormous human cost. My intention in these columns is not to revive sad memories of the losses and destruction but instead I want to remember the bright rays of hope that emerged briefly during those dark days. What is heart warming to me after a decade are the memories of how the Sri Lankan people shed all differences in an upsurge of humanity in the aftermath of the horrible Tsunami. I wish to particularly emphasise on how people of different ethnicities helped each other at the time of tragedy notwithstanding the fact that Sri Lanka was and is a deeply divided society. 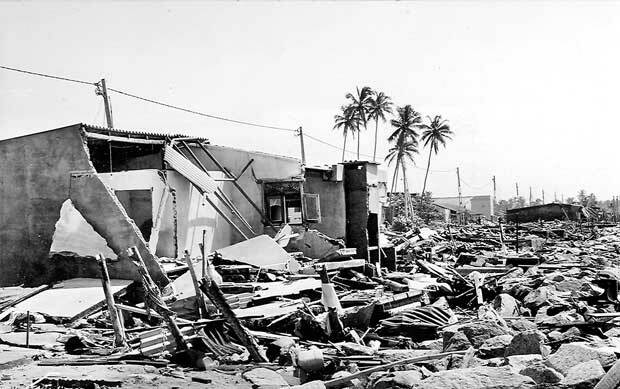 Looking Back at the Tsunami tragedy one is struck by a recurring feature widely prevalent in Sri Lanka namely the inefficiency of the state machinery to address the imperative needs caused by sudden disasters of huge proportions. This inability or unwillingness to cope with a serious emergency situation was felt immensely in the aftermath of the 2004 Tsunami also. Another Sri Lankan trait of playing petty politics in matters concerning human misery and suffering was also manifest in the Tsunami aftermath. What I recall then was the ‘cold war’ between President Chandrika Kumaratunga and her Prime Minister of the day, Mahinda Rajapaksa. It is easier now to understand the hidden dimensions of this divide between President and Prime Minister against the current backdrop of the Presidential poll which in reality is a fight between Mahinda and Chandrika. What happened then was that President Kumaratunga was on holiday in Britain when the Tsunami struck Sri Lanka. It was Prime Minister Rajapaksa who had to provide leadership in dealing with the crisis. Several measures were enacted by him. However Chandrika Kumaratunga was forced to cut short her holiday in Britain because of the tsunami disaster and return to Sri Lanka. One of her foremost tasks after reaching Colombo was to “undo” all that the Prime Minister had accomplished in the immediate aftermath of the tragedy and bring the entire relief and re-construction effort under the centralised authority of the President. It seemed apparent then that the speedy return and “sacrifice” of her holiday was propelled more by narrow political considerations rather than overwhelming concern for the affected people. The manner in which President Kumaratunga embarked on the massive humanitarian task of rehabilitating and re-building tsunami affected Sri Lanka left much to be desired. Two trends seem patently clear at that time. Firstly, the post-tsunami rehabilitation and reconstruction was being done in a highly questionable, secretive, centralised approach under which the voices of the affected masses were not being heard. If fate in the form of a tsunami has dealt the underprivileged a terrible blow the state in the name of post-tsunami relief was arbitrarily deciding the future of this pathetically marginalised sector. Secondly, the post-tsunami rebuilding effort seemed to be going far beyond the imperative need to alleviate sufferings of the affected and displaced people. The ambitious plans formulated without consulting the affected people envisaged heavy allocation of resources and investment in projects totally outside the parameters of post-tsunami rebuilding. Sri Lanka was particularly fortunate in attracting the Western world’s sympathy thanks mainly to the excessive attention given by global media, the spontaneous upsurge of caring concern by foreign people and the high profile visits to the country of people like Colin Powell, Kofi Annan, Paul Martin, etc., The country was also lucky because of the prevailing international situation with the prickly politics of Jakarta -- Banda Aceh and that of India declining international assistance. Thus Sri Lanka was then the major beneficiary of international munificence. Making hay while the sun shone, Colombo drew up elaborate plans for reconstruction costing US$3.8 billion. What was troubling then was President Kumaratunga displaying all the signs of negative bungling as was typical in the past. As stated earlier Chandrika returned home and immediately dissolved the structures set up by her Prime Minister. She brought everything under her control. The tsunami crisis and aftermath required a de-centralised approach given the socio-political-economic aspects of an affected society. What was needed by the government was to outline a broad policy and coordinate all relief and rehabilitation activity. Instead of coordination there was excessive centralisation that stifled and suppressed. Apart from its impracticality this centralisation went against the general thrust of constitutional reform which sought to devolve more power to the periphery. Basically what was done then was setting up three task forces under the President. The two crucial ones were headed by her confidants Dr. Tara de Mel and Mano Tittawela both of whom held other posts too. There was no doubt about both of them being capable and efficient. The point however was that vital functions regarding tsunami relief and reconstruction had been placed under centralised authority that bypassed the civil administration and did not give priority to the people. A sluggish government machinery struggled to establish itself in tsunami affected areas. Yet the top heavy Presidential task forces were quick to rush out with elaborate reconstruction plans. Worse still was that these plans had no constructive input from the people. Even before full particulars from the victims were collected or tabulated the planners in Colombo formulated expensive re-building plans.What was on display was an abysmal contempt for the victims in whose names the large scale aid was being obtained. This centralisation by Chandrika then was exclusivist, secretive and despite bombastic propaganda flawed and ineffective. The Prime Minister and important ministers including those from affected areas were excluded in the major decision making or policy formulation process. The coalition partner Janatha Vimukthi Peramuna (JVP) which had its political stronghold in the affected Southern Province was not consulted or included. The main opposition United National Party (UNP) except for some exercise in optics was out too. The parliamentarians representing the North and East too were not included. Neither the Tamil National Alliance (TNA) nor the Sri Lanka Muslim Congress (SLMC) was consulted formally. The cumulative effect of the excessive focus on reconstruction plans without prioritising the immediate needs of the affected victims resulted in the government failing the people miserably in the days and weeks after the tsunami. The bubble burst when Tilak Ranaviraja who was then the Commissioner General of Essential Services and Public Security and Law and Order Ministry Secretary admitted at a media meet that 70% of the tsunami victims -- even after five weeks -- were yet to receive government aid. Moreover, this figure applied only to 960,000 people living in government-controlled areas. The position regarding an estimated 160,000 tsunami victims then living in LTTE-controlled territory was not known. It was logical to assume that if the situation was so bad in government areas, then the position in Tiger-controlled areas would have been even worse. The Essential Services Commissar also made an announcement at the news conference that President Chandrika Kumaratunga had instructed him to ensure that at least 75% of the people would get government aid by February 7, 2005. He assured that the state machinery would be working overtime to implement that order. Ranaviraja made it sound then as if President Kumaratunga was totally unaware of the prevailing situation and that she was acting promptly as soon as she learnt of the problem. It was almost as if her excellency had nothing to do with ongoing tsunami relief activity and that someone else had bungled. If the government and the politicised bureaucracy had failed miserably for weeks in the duty of providing relief to tsunami victims, the billion dollar question was how on earth did the affected people survive all these days? The answer to that was -- thanks to the people. The state may have failed in its responsibility towards the people, but thank God for the people. The hackneyed phrase about people rising to the occasion came true in Sri Lanka after the raging tsunami killer-waves had done its job of destruction and devastation. The bulk of tsunami victims survived in the post-tsunami days because of the generosity of the people. If not for civil society comprising ordinary people, non-governmental organisations, religious groups, security forces and the LTTE, the people would have starved. What I recall with great happiness now is the silver lining that was so visible in the dark cloud then, was this role of the people. Civil society in the form of people were the saviours of their fellow human beings. The greatest thing about the situation then was that the concern and care shown was genuinely spontaneous, cutting across all man-made barriers of race, religion, caste and creed. It has been observed that a crisis brings out the worst and best in humankind. In conflict ridden Sri Lanka the tsunami brought about great devastation which has been recorded. What it also brought out then was an unprecedented upsurge of humane fellowship and humanitarian generosity. This unfortunately did not receive the publicity it ought to have got then. Let me therefore recount what happened in these columns even as the 10th tsunami anniversary draws near.. I used to talk over the telephone with people living in Batticaloa and Ampara Districts in the immediate weeks after the tragedy. I also got several e-mails and even a few letters from people in the East back then. With a few exceptions, my interaction at the time was with people of Tamil ethnicity. This provided a great insight into the tsunami and about what had happened in its aftermath. Death, devastation and displacement -- their experience was terrible indeed. But along with their tales of woe, many had one uplifting message to relate with gratitude -- man’s humanity to fellow man. The Batticaloa-Ampara demography is such where the Tamils and Muslims live densely in interspersed but separate villages along the littoral. This region is called “EluvaankaraI” or “shore of the rising sun.” This is largely between the sea and lagoon. The hinterland to the west of the lagoon is called “PaduvaankaraI” or “shore of the setting sun.” Lands close to the lagoon are Tamil-inhabited. The Sinhalese, many of them settled under state sponsored colonisation schemes, were for the most part living in the rural hinterland. Mercifully Sinhala victims of the tsunami were comparatively few in Ampara and Batticaloa districts because they were not living along the coastal belt in the East. This was a blessing because whatever the ethno-centric politics of the region, the Sinhala people rose magnanimously to the aid of their afflicted Tamil and Muslim brethren. They came with food, clothes, medicine, etc., to help the victims. They helped set up camps. Many Tamils went into Sinhala areas as refugees. The bloody legacy of the past was overwhelmed by this blooming humanism. 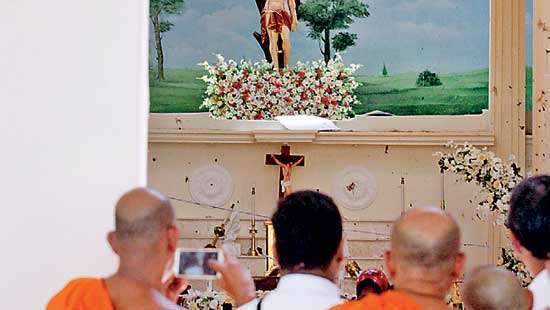 The media spotlighted the refugee camp run by Buddhist monks in the vicinity of the 1987 Arantalawa massacre by the LTTE. Many Tamils became refugees there. Many of the Sinhala medical staff in eastern hospitals too worked round the clock to treat mainly Tamil and Muslim patients. Some of these people were from the South and their families had been affected too. Yet they toiled on regardless here in the East instead of going South. A friend in Batticaloa with a long history of Tamil nationalist politics summed up the changed situation thus, “For many decades we resented the Sinhalese coming here and settling down. We felt that this land belonged to us and that they were outsiders who had no business here. Now in our misfortune it is they who are coming to our aid. Even Sinhalese from other places are coming here instead of going to the South on a “Sinhala Consciousness” basis. Whatever the past we cannot forget their help or be ungrateful. I am ashamed of myself when I recollect applauding and cheering our leaders like Kasi Anandan who mouthed utter hate against the Sinhala people”. Unlike most “vocal warriors”of the Tamil Diaspora who spout venom against Sinhalese, my friend has an impressive track record in fighting through non-violent means for Tamil rights. He has spent years in detention as a result. He even rejected lucrative offers of employment in Colombo and abroad to be with his people. What he told me then was genuinely spontaneous and came from his heart. Apart from Sinhala residents in the East, unaffected Tamils and Muslims too rushed to help the victims. Again much of this concern cut across ethnic barriers. Many victims of Hindu and Christian faiths were buried along with Muslims in accordance with Islamic tenets. With Tamil and Muslim villages being interspersed like the ‘flour and coconut in a pittu bamboo’ the lashing waves had victimised both simultaneously and similarly. Help to the victims from fellow ethnics extended to others also. When food was given to Muslims by Tamils care was taken to ensure that the meat was ‘halal.’ Likewise, Muslims giving food on Tuesdays and Fridays to Tamils made sure everything was vegetarian. Sinhala assistance too was to both communities. In addition to the Eastern Province Sinhalese, others from outside districts too came with help. The then North-Central Provincial Chief Minister may have refused to “loan” provincial vehicles to be used for tsunami relief work in the North-East, but ordinary Sinhala people from the Rajarata shamed the communal politicians by rushing in to help. People from Anuradhapura and Polonnaruwa came to the East with food and provisions. Batticaloa town areas and Batticaloa North was indebted to the Polonnaruwa people for many, many days. Many Sinhala people were seen carrying aid and walking for miles to reach inaccessible areas in the East. This was not all. Even from other provinces -- Sinhala, Muslim and Up-Country Tamils also rushed to the North-East with help. They were prepared to go to Jaffna, Mullaitivu and the East. The security conscious LTTE did not oblige. They refused to allow these people into areas under its control. People were asked to leave the things they brought with the LTTE and return. Some did so. But many refused and turned towards the East. What is commendable about this Sinhala munificence is that it could have been directed towards the tsunami-affected Sinhala majority districts of the South and South-West alone on the basis of kindred ethnicity. Yet it was an indicator of the large-heartedness of the ordinary Sinhala people that they chose not to do so. In that context it must be noted that much help from Up-Country Tamils too went to the South to affected Sinhala people. With state machinery failing miserably it would not be an exaggeration to say that it was the overwhelming generosity of the ordinary people and the concerted efforts of NGOs and relief organisations that fed, sheltered and clothed the victims in the initial stages. The abysmal failure of the government to get its act together extended this state of dependency further for weeks. Even now many affected people in the East acknowledge with gratitude that they would have starved if not for the help from other ordinary people and NGOs . Their opinion of the state and its bureaucrats remains at a very low level. Another noteworthy phenomenon in the tsunami crisis was the role of both the armed forces and the LTTE during the tragedy and its immediate aftermath. The STF, army and navy stationed in the North-East rescued many people from the raging torrents. Some security personnel lost their lives trying to save civilians. Members of the armed forces even helped Tiger cadres. 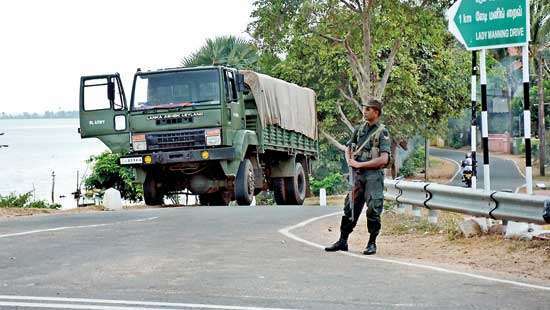 Likewise, the LTTE too helped save affected security personnel. For one great moment spanning a few days all animosity and enmity was forgotten in the face of common adversity. Alas. That blissful state soon diminished and ceased. The armed forces were of tremendous help towards the affected people too. They provided food and other stuff. It was a welcome sight at that time to see Tamils in refugee camps flocking around security personnel without any fear. The spirit of bonhomie that prevailed between the security forces and the Tamil people in the early days after the tsunami was truly uplifting. This was when the trappings of the state had withered away due to the tsunami. Acting as human beings instead of as the wardogs of the state, the predominantly Sinhala armed forces transcended their ethnicity. The humanity that shone brightly then began slowly losing its lustre after the government began re-asserting its authority. In a bid to re-establish its eroded authority the government brought the armed forces into the running of refugee camps. This was resented by the LTTE. Already the Tigers were feeling threatened by the new spirit of camaraderie between the armed forces and the people. Now with this changed official status vis a vis the refugees, the LTTE began its customary undermining campaign against the armed forces. People were forced to sever links with the armed forces. Hostility began increasing between the armed forces and the Tigers in a bid to assert respectively their sway over the people. Using the armed forces as an instrument of the state to prevent affected people returning to their former homes also began causing friction. On another level,expatriates both Sinhala and Tamil continued to live in their ‘ghettoised’ states of mind engaging in the politics of hate. The pro-Tiger Tamil media had been spotlighting only those instances where aid lorries to the North-East were blocked or turned away or hijacked by undesirable elements. The numerous instances of overwhelming and spontaneous assistance rendered by ordinary members of Sinhala civil society was blacked out deliberately. It seemed an impossible task for these elements to acknowledge the inherent goodness and humanism in the other. Besides the propaganda theme in fund-raising that Tamils have to give lavishly because the Sinhalese were willfully depriving would not have carried weight if these facts had been publicised. As for Sinhala expatriate circles, some websites demonstrated that many hardliners under the pretext of opposing the Tigers were trying to restrict aid reaching the affected Tamil people. Worse still was the revelation made by former Indian Additional Secretary B. Raman in an enlightening article on the tsunami and Sri Lanka. Raman’s observations did not elicit any response among expatriate Sinhala circles. One had to assume therefore that his observations were accurate and incontrovertible. But the Sinhala people should not be given a bad name for the actions of a few. For that matter neither Tamils nor any ethnic group should be tarnished for the actions of a few constituents. In the case of the tsunami tragedy the expatriates both Sinhala and Tamil seemed completely cut off from the reality in Sri Lanka. 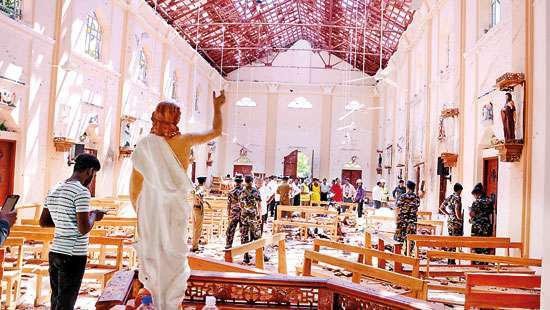 The people living in Lanka had risen above race, religion and ethnicity to help one another. But those living abroad were prisoners still of the unsavoury past. Sadly the inter-ethnic amity that prevailed in the aftermath of the tsunami when the state was absent began giving way after the state started making its presence felt .The state’s belated intervention in the lives of the tsunami-affected people gradually led to a reduction of ethnic amity too. The actions of the politicians and the majoritarian government too was disgusting . The ordinary Sinhala people had rushed to help those in the Tamil and Muslim areas on a need oriented basis. They did not let ethnic considerations determine their solidarity with the affected children of Sri Lanka. The government was a passive spectator in the initial stages. But now in the post-tsunami phase what did the government do? The Govt began playing shameful majoritarian politics despite lofty rhetoric to the contrary. According to preliminary needs assessments by the World Bank the damage incurred provincially was roughly 40% in the East; 30% in the South; 20% in the North and 10% in the West. The north-east therefore had incurred 60% destruction. But the government focus in the immediate Tsunami aftermath was on the South and West. Most plans were for South-West reconstruction. Few assessments were done in the North-East. A clear ethnic bias was shown by the majoritarian regime. But to their eternal credit the ordinary Sinhala people shamed their rulers by acting magnanimously above ethnic considerations. The shameful situation that prevailed in the period after the Tsunami highlighted the disgraceful conduct of the state.On the one hand we saw the state failing to address even the immediate needs of 70% tsunami-affected people. On the other hand, we saw the government rushing to produce elaborate reconstruction plans. The government that had not supplied immediate relief to a large majority of victims and had not even properly counted the dead rushed with obscene haste to formulate reconstruction blueprints. Obviously the objective was to get hold of money. The disgraceful tussle among politicians to reconstruct the Galle bus stand was a worthy example. While one agency was prepared to do it for just five lakhs two powerful politicos with bids of Rs.4.1 million and Rs.5.1 million obstructed it. It was indeed saddening and maddening to see all the inter-ethnic goodwill created in the aftermath of the tsunami being frittered away by governing politicians. A noble and worthy government would have built on the climate of amity after the tsunami tragedy. But the government of the day continued to blunder. The Sri Lankan people had risen to the occasion magnificently at a time when the state let down its people very badly. Now that failed state slowly crept back, sowing seeds of friction among the people. The people of Sri Lanka who displayed commendable inter-ethnic solidarity amid the tsunami tragedy saw the government run by cheap politicians ruin things once again. Inter-ethnic dissension was promoted to divide the people so that the ‘corrupt’ ones could have a field day as usual. The state that failed its people at their hour of need was allowed to disrupt the climate of amity again. The people who did not fail their fellow people failed to come forward as one nation and prevent the evil machinations of the state. The tsunami has come and gone. Ten years later Sri Lanka continues to be in the throes of a permanent man-made tsunami -- a tsunami of ethnic mistrust and hatred swirling about the country and its people. On this solemn occasion of the 10th anniversary of the Tsunami, one can only yearn nostalgically for that brief period in time when the Sri Lankan state ceased to exist functionally and its people rose up above considerations of race, caste and creed to rush to help their fellow Sri Lankans. Truly it was the time when the destructive waves of the tsunami brought humanity ashore to constructively bind hostile strangers in fraternal brotherhood.